10thMountainFire posted this as a comment in our morning links. But we thought it deserved its own post. If you’ve been wondering lately after the lockout why you bother, this should remind you pretty firmly. And we as well would like to thank him for his service, as well as making the three of us extremely proud of what we do here, no matter how silly it can seem at times. Please excuse this post, especially the length… but I love you guys here and I want to share something that means a lot to me as a Hawks fan. Last night I had one of the most incredible and surreal experiences of my life and I’m compelled to leave it here in order to reinforce the idea we have about what a special organization the Chicago Blackhawks are. In 2009, while on deployment, my family placed me on a waiting list for the USO’s spot to honor veterans next to Jim Cornelison during The National Anthem. I was called last week, as my last week in the Army came to a close, and informed that I was chosen for the Detroit game. To say this is an honor is to truly understate what this experience is. It is indescribable; every Hawks fan in the building thanks you for your service. They offer you beers. They truly are interested in your experiences and grateful for the service of the serviceman/woman. When I arrived, I was treated like a returning Roman warrior; I was parked next to the stadium and brought in through a special entrance. Everyone treated me with incredible respect… from the parking attendants to the in-stadium personnel and fans. I was ashamed that other men and women I served with were not going to have this experience and I felt guilty at times. When I reported to the ice area to go out with Mr. Cornelison, I was informed that I would be accompanied by a WWII Marine Corps veteran in a wheel chair. 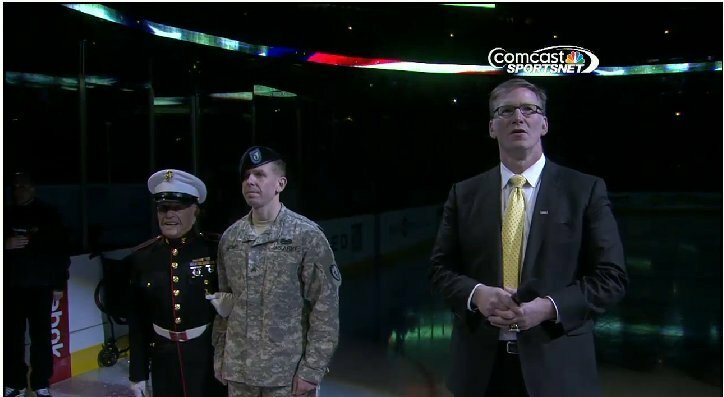 When we got on the ice, they situated me next to Mr. Cornelison, to the left of the Marine. At this point the Marine decided he wanted to stand for The Anthem and present arms. So I assisted him out of his chair and held him as he saluted throughout Then Anthem. It was an honor I can never hope to duplicate. I was seated in section 104 with a group of Detroit fans in front of us, having traveled to Chicago to see the Wings. They were loud, supportive of their team, and gregarious. During the second intermission, one of their relatives, in a Hawks sweater, came over to me and engaged me in a conversation that began by asking me where I had deployed to (multiple times to Afghanistan). As the conversation progressed, he let me know that he had come to the US from Iraq in 1978. He was holding a beer, having a great time, and cheering on the Hawks against his relatives from Detroit. I quickly became aware that this interaction specifically, and the night generally, would be among the great experiences that I will recall at the end of my life: a soldier being treated like gold, sitting with Iraqi-Americans, cheering hockey while drinking beer and roaring for the Anthem and the Hawks. I have never felt more appreciated as an American soldier. The Chicago Blackhawks do this with little recognition; but soldiers all over the world last night were tuned in because I let them know what was about to happen. I told them I was there not for me but for the men and women we served with that didn’t come home and couldn’t be there, those who are out of the ranks now and recovering from wounds anonymously, and those that still walk the post ensuring our safety and security. A final note: last April, SSG Dave Nowaczyk, a Hawks fan who I served with at 10th Mountain in Kunar and Nuristan in 2009, was killed on his third trip to Kunar in the village of Pashad in Sarkani District. Other than the initial television notification, not enough Americans are aware that he lived and served… but he was part of our family of Hawks fans and he wasn’t there to see Soldiers and Marines honored like that last night. Guys like that made it possible for me to experience that. And for that, I’m grateful. The Chicago Blackhawks are the best organization in sports. Soldiers now all around the world, seeing the Anthem display last night, now know that. We’re global. Go Hawks. Edit: I should note that this was my last official wearing of the uniform.